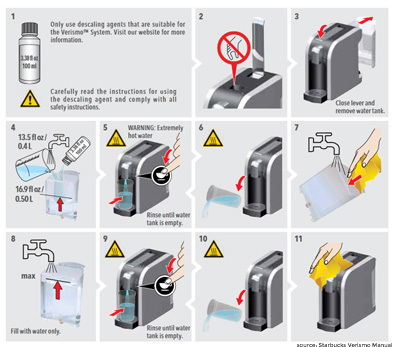 A detailed how-to on how to clean Verismo machine to make it shine and keep it running efficiently. Our coffee makers might possibly be the most overlooked items in our home when it comes to cleaning. Keeping them nice and clean is important for so many reasons, but in short: a clean coffee maker makes better coffee and lasts longer. Daily: Rinse the machine once, after the last time you use it (before turning it off). Weekly: Rinse, and turn off your machine. Remove the drip tray and water tank and empty them. Wipe the unit with a wet cloth. Hand wash all removable parts with mild detergent and dry with soft cloth. Monthly: Clean your machine with Urnex. Every three months: Descale your machine with Durgol. 1. Rinse the machine once and turn it off. 3. Wipe the unit with wet, soft cloth. 1. Lift and close the handle to make sure the pod is sent to the bin, then remove the water tank. 2. Pour one bottle of Urnex into the reservoir and fill the rest with fresh water, to the max fill line. 3. 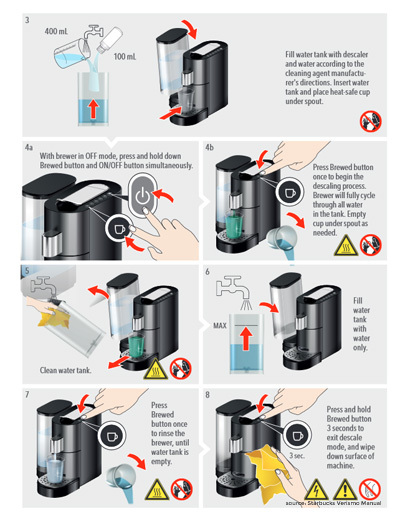 Put the reservoir back, place a large cup or a bowl on the drip tray and rinse: for Verismo 580 and 583 use middle – brewed coffee button to rinse, for Verismo 600 and Verismo V use a dedicated rinse button. Repeat the rinse step until water tank is empty. 4. Remove the tank, rinse it well and fill with fresh water only. Put it back and repeat the rinsing process until empty. Do this twice. 5. Quickly wipe the machine with a wet cloth, empty the bin, put the reservoir back and you’re done. Note: You need to rinse and discard 1 reservoir of cleaning solution + water. Then rinse and discard 2 full reservoirs of fresh water. Don’t forget to always keep a handle closed while rinsing. Starbucks recommends you descale your machine once every three months (depending on the level of water hardness in your area) and to use the Durgol Swiss Espresso Special Decalcifier. 1. Lift and close the handle, and remove the water tank. 2. Pour one bottle (4.2 oz) of Durgol into the reservoir and add about 12 ounces of fresh water. The reservoir needs to be only half full. 3. Put the reservoir back and rinse: for Verismo 580 and 583 use middle – brewed coffee button to rinse, for Verismo 600 use a dedicated rinse button. Repeat the rinse step until water tank is empty. 4. Remove the tank, rinse it and fill it to the max fill line with fresh water only. Put it back and repeat the rinsing process until empty. Do this twice. 5. Quickly wipe the machine with a soft cloth, clean out the bin, put the reservoir back and you’re done. Note: Rinse and discard 1/2 reservoir of Durgol + water. Then rinse and discard 2 full reservoirs of fresh water. Don’t forget to always keep a handle closed while rinsing. 1. Lift and close the handle to make sure there’s no pod in the unit, then remove the water tank. 2. Pour one bottle (4.2 oz) of Durgol into the reservoir and add 13.5 ounces of fresh water. 3. Put the reservoir back, place a large mug or a bowl under the spout and turn the machine off. 4. While the machine is off, press the brewed coffee button and on/off button at the same time just once and hold them for a second. Don’t press them few times or hold for too long. 5. Next, press brewed coffee button to start dispensing water – the brew button should blink white. Repeat the rinse step until water tank is empty (use brewed coffee button to rinse). Always keep a handle closed while rinsing. 6. Remove the tank, rinse it well and fill it to the max fill line with fresh water only. Put it back and repeat the rinsing process using brewed button until empty. 7. Wipe the machine with a soft cloth and clean out the bin. 8. Press and hold brewed button for 3 seconds to exit descale mode and you’re done. Note: Rinse and discard 1/2 reservoir of durgol + water. Then rinse and discard 1 full reservoir of fresh water. It’s recommended to descale your Verismo V every 3 months. If brewed button blinks red during drink preparation, you also need to descale the brewer. But, that’s only if you’re using the Verismo V model. On old Verismo models (580, 583 and 600) the red button is a protection from overheating. If the rinse button is blinking red and hot water button is blinking green then that’s the reason. This normally lasts for about 60 seconds and after that, the machine should turn on back again automatically (all lights will go green again). This can happen when the brewer is used a lot, so keeps the machine safe from overheating. You don’t need to descale the brewer. 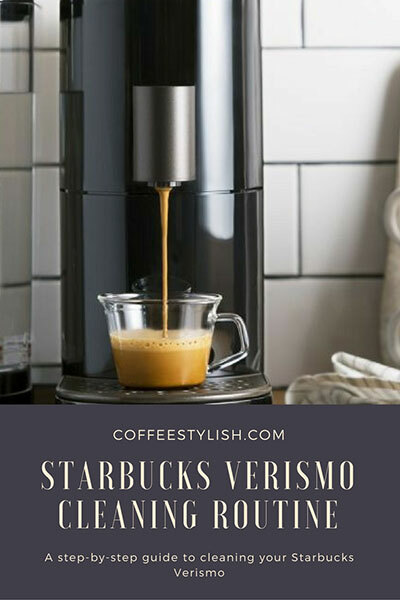 If brewed button on your Verismo V blinks red permanently and quickly, and won’t stop even though you descaled your machine you will need to contact Starbucks Customer service at 1-800-334-5553. After some time, your Verismo machine can develop sour smell because of the milk pods. With espresso machines, it’s really important to clean all the parts that come in contact with milk, after each use. The problem with Verismo is that milk goes through an entire unit and you simply can’t clean it properly. Starbucks recommends you rinse the machine after brewing a milk pod, but this isn’t enough. So, prevention is really important here. Because once that spoiled milk smell develops it’s almost impossible to get it out. That’s why I suggest avoiding using milk pods in your machine from the start, if possible. Spend your money on coffee pods instead and use real milk! Espresso tastes so much better with fresh milk and your machine will last longer. And will smell so much better. When using fresh milk, use after you’re done with brewing process and pour milk directly into the cup. Do not use milk in the Verismo water reservoir because this can damage the machine. Investing in a milk frother can be a good choice. The frother will last longer and I’m sure we all agree that fresh milk always tastes better than the powdered stuff. You can find some great options on Amazon. If the smell has already developed, you can try cleaning your machine with special dairy cleaning solution like Rinza. It’s for use on steam wands and milk frothers (not really for use on internal parts of the brewer, so please use at your own risk), but I’m sure it can help clean the milk protein build-ups and I honestly doubt it will do any damage. How to clean Verismo with Rinza: pour 1 oz Rinza and 16 oz water in the tank, and place the tank on it’s place. Run milk button twice. Let the brewer sit for 15 – 20 minutes, then press milk button again until the tank is empty. Remove the tank, rinse it well and fill with fresh water only. Put it back and repeat the rinsing process until empty. Do this twice. Note: You need to rinse and discard 1/2 reservoir of cleaning solution + water. Then rinse and discard 2 full reservoirs of fresh water. Don’t forget to always keep a handle closed while rinsing. I descaled my V yesterday and everything went great! Just like the instructions said it would. Which surprised me. Nothing ever happens like that for me. :) And then I made a cup of coffee…there it is! What I was waiting for. Lol. I noticed about half way through the coffee cycle that the coffee just stopped pumping out but I could still hear it going somewhere. It wasn’t leaking out tho. Once the cycle stopped, I checked the used pod container and there was the rest of my coffee. How did that happen? It didn’t do that before I descaled it. I’m not saying that has anything to do with it. Just that it had never happened before. Made a second cup…that one was fine. Yay me! Then this morning, I lost half of my coffee to the used pod container again. Help, please? I have exactly same situation…don’t know why yet. Hi Charlie, please check the pod bin to make sure the pod is not stuck in the machine. Next, lift the handle all the way back (don’t insert the pod) to make sure it’s in the place and aligned properly then firmly close the handle. If the handle is not closing properly the water can leak. Also, check the valve at the bottom of the water reservoir to make sure it’s fine. If everything seems ok but the water is leaking in the pod bin, there is a chance that the hose or a valve in the machine is damaged and I recommend to call Starbucks Customer Service at 1-800-334-5553 and 1-877-421-9062 in that case. I hope this helps. Do one extra rinse before use and it should be fine. I even tested to make sure my hot water pulled an exact 5oz cup before wasting any precious pods. I’m also surprised the descale process saved the machine. Was ready to called the 800 number. I have run vinegar and water through it and washing the tank thoroughly and then ran the full water tank probably 2-3 times until there is no vinegar smell left coming out of the unit into the cup with no pod in the machine. I also wipe with a damp cloth inside around where the cup goes to clean any coffee debris. I have also used the Durgol descaler and cleaner. I always use filtered water in the machine because I have hard water and don’t want to build water deposits unnecessarily in the machine. OUR VERSIMO V has started leaking a small amount of coffee overtime we use it. Help? First time i descaled verismo v, while descaling, water was hot and rinse cold. Descaling 3 months latter, and descaling is cold water and so is rinse. Tried again, started to come out hot and changed to cold during descaling phase. Called customer service and they don’t know what temp water should be during first phase of descaling?????? Can you help? Don’t know if machine is broken? Coffee is hot. Hi Lisa, I am not sure about the exact temperature, but correct, the water is normally hot during descaling phase. Since the coffee is hot, heating elements are probably just fine. I would try and contact customer service again, maybe you will have more luck with another customer service representative and maybe he will be able to provide some additional instructions. What I am worried about is that descaling with cold water won’t do the job properly and that could cause problems in the future. Maybe there is something wrong with the descaling program. I hope this helps. Please let me know how it went. Just descaled again and cold both cycles so called verismo customer service again. Got a very nice representative this time w knowledge and she said descaling should be cold water during both cycles? Have you done a descaling on a verismo V machine were it has come out hot on first cycle? I thought first time i did it 3 months ago it was hot? Thanks for your help! I only used it for drink preparation, I haven’t descale it myself. However, on all my equipment, descaling is always done with hot, not cold water. I sent an email to Starbucks yesterday, but still waiting for their response. Will keep you updated. You are welcome! Hi Lisa and thank you for your patience. I just got a response from Starbucks and they said the water should come out hot during the descaling process. I am really not sure what to do next, maybe you can try with Customer service once again. I hope this helps a bit. Where can I find durgol to descale my verismo? you can purchase Durgol on Amazon. I followed the instructions to descale my Verismo V. The last part was to hold down the brew button for (3) seconds to exit descaling mode. But the brew button is still blinking red. HELP!! My descalding light came on so i have trying to that. I put the solution and water in, i pushed the buttons over and over again. There is still NO water coming out! HELP! What do i do next? can you please tell me which light was blinking and what color, and what model you use? I guess it was the red blinking brewed coffee button and it’s the Verismo V model? If you’re using Verimo V, you need to first turn off the machine. Fill the tank with decaling solution/water, place the tank back and make sure the tank is placed properly and the handle is closed. Then, while the machine is off, press the brewed coffee button and on/off button at the same time just once and hold them for a second. Don’t press them few times or hold for too long. After that, press brewed coffee button to start dispensing water – the brew button should blink white. Please make sure you’ve done everything correctly. If it still doesn’t work even though you’ve followed all the steps, you will need to call Starbucks customer service at 1-800-334-5553. As for the button, is the button still blinking red or it stopped? Because if it won’t stop blinking or it stays red all the time, that’s also a reason to call Starbucks customer service. Yah! Thanks Teri for this post. Wasn’t able to use my Verismo for over a month since after cleaning it I couldn’t get it to pump at all. Almost bought a new one!! Yikes! Your method worked for me! I’m sorry that you’re having issues with your machine. Try to pump top stainless steel handle up and down about 20-30 times. The machine can become ‘stiff’ when not used and have to be broken in a bit. This might help. I would definitely try cleaning if you have the time in case it’s clogged. You’ll find cleaning instructions here. If both of these things don’t work, it’s time to call Starbucks Customer Service (available Monday – Friday, 6 a.m. – 3 p.m. , at 1-800-334-5553 and 1-877-421-9062). Thanks for stopping by and let me know if you need anything else. Same issue for me. The customer service lady was rude when I called for help too. Im very disappointed to hear that they don’t even repair the 600 anymore since they made the new version. Won’t be buying another one of these. Have you ever tried running a vinegar and water solution through the machine? I’ve done it and it works pretty good. I don’t have a sour smell at all. However, I’d like to look inside the machine somehow but alas I think that would render it useless. Is it half vinegar and half water? I was worried to try that, since it says not to use anything else but specified Starbucks leaning products. that’s correct, Starbucks recommends using commercial cleaners in their machines. But if you decide to use vinegar, fill the tank with equal parts white vinegar and water.